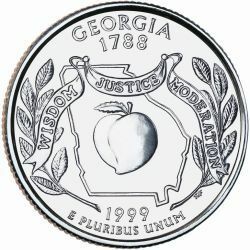 Georgia State Quarters were the fourth in a series of fifty design changes over a ten year period from 1999 to 2008. The Georgia Quarter was released into circulation on July 19, 1999. The back of the coin shows an outline of the state along with a peach, the best-known symbol of this southern state. The reverse also has live oak branches on either side as an example of the state tree. Lastly, a flowing ribbon is inscribed with the motto "WISDOM JUSTICE MODERATION". The reverse of the coin bears the inscriptions "GEORGIA 1788", "WISDOM JUSTICE MODERATION", and "E PLURIBUS UNUM" along with the date of 1999.